A short version of Jane’s film THE WAITING ROOM was the centre piece of the 8th Annual Conference on Dementia and End of Life organised by The National Council for Palliative Care and the Dying Matters Coalition and held in London on 4th December 2013. The film is about the time Jane’s Dad spent on a psychiatric ward and was programmed to illustrate the lived experience of people living with dementia – it seems that people were truly shocked by what they saw and we have been humbled (and pleased) by the response to the film. We have been making The Waiting Room for over five years, long before Josh died. Filming started when Jane’s Dad, (Josh’s Grandpa) Gerry went into hospital in 2008. Then aged 92, he had early stage vascular dementia and after her Mum Pat had a stroke and could therefore no longer look after him at home, efforts were made to find a suitable place for him in a local residential home but none were available. So Gerry was admitted to the Ailsa Psychiatric Hospital near Ayr, their home town in Scotland. This was a far from ideal solution to the problems faced by the family, and with the thought that surely things would improve for both Gerry and Pat, we began to film with them both. As it turned out Jane spent more and more time trying to deal with a system (its called the NHS!) than actually being with her parents as they moved into the final chapters of their lives. She now sees these as lost years rather than last years. 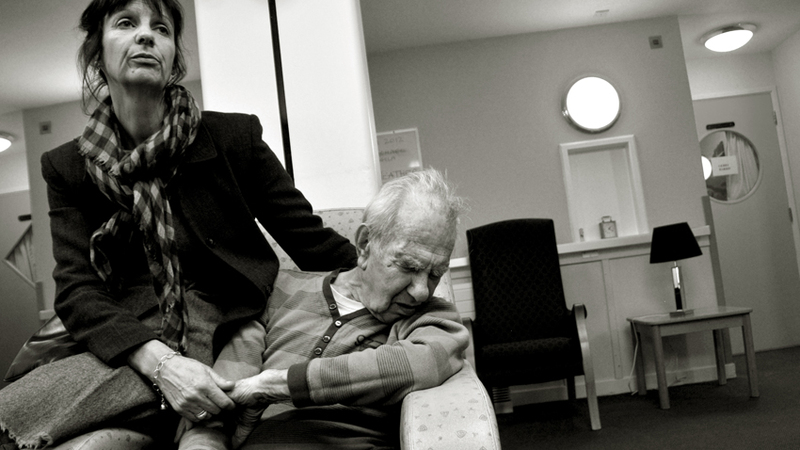 But as the dementia progressed to its inevitable end stage, Jane’s efforts to find a more ‘person friendly’ care package, a more stimulating environment, a more comforting and less intimidating final ‘home’ for her dad, were mostly in vain. For reasons we believe were the result as much as the lack of care as of the progress of the disease, Gerry’s well being went into steady decline and he never left the hospital. He died earlier this year and you can see our farewell tribute to him here – FAREWELL GERRY. FAREWELL GERRY was culled from the many hours of footage we have of Gerry and is a very different film to THE WAITING ROOM which had its first public screening at the Conference for the NCPC/Dying Matters Coalition. Shown at the start of proceedings, the film quickly became a talking point for the remainder of the day as delegates recognised it as a cautionary tale for a health service faced with an ever increasing ageing population many of who will die with dementia. You can watch it here. This version of THE WAITING ROOM is 81/2 minutes long. It should and could be longer – it should and could be made available as a educational or training resource for all in the caring professions. But without adequate funding we are not currently in a position to develop the project further. So … if you or you know anyone who can help us achieve this goal, please do contact us. Unfortunately we didn’t have the following information at the screening of THE WAITING ROOM at the conference. We have only just had a reply from the NHS trust for Ayrshire and Arran as to the total cost of Gerry’s care while he was in hospital. 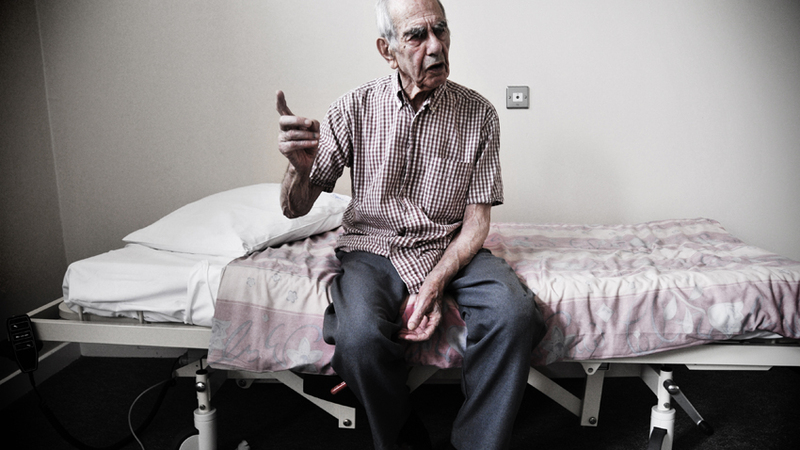 And it is staggering – the cost per day for a patient in an Elderly Mental Health Bed is £408. So the total costs for the four years that Gerry was in hospital amounts to close on £581,000. But this is a minimum estimate and does not include the extras for two hip replacements and their aftercare, antipsychotic drugs, and the one to one observation that Gerry required to stop him getting out of his chair. Compare that with the costs for keeping Jimmy’s mother Emily (of a similar age and with a similar condition – advanced alzheimers dementia) in a private residential home – this is £650 per week or a possible £135,000 over four years – less than one quarter of the cost of Gerry’s care. This raises so many questions we can’t go into here but if you’ve watched the film you will know that this is money not well spent.